The Port of Kalamata is a small coastal harbor, located a short distance from the city. A nice promenade with plenty of cafes is adjacent to the cruise dock. 200 meters further is a nice beach, rather narrow and pebbled. Bus 1, which stops right in front of the cruise dock, will take you to the historic center, about 1,5 km away. You can take the bus either way as the drives in a loop, along the beach and than to historic center or vice versa. This trip is like a little sight-seeing trip. Only 1.30 euro each way, pay the driver in cash. Weekdays every 15 minutes, saturday about every 20 minutes, sundays every 30 minutes. Capital and chief port of the prefecture is the much sung Kalamata, the land of the Kalamatianos dance and the silk kerchief. Of succulent black olives, honeyed figs and the sesame-covered sweet called pastelli. The town is dominated by the 13th century castle above it built by Geoffrey de Villehardouin. On the north side of the citadel there is a small Byzantine church, dedicated to the Virgin of Kalomata (of the good eye), from which the town may have acquired its name. The modern name Kalamáta is a corruption of the older name ?a??µa? meaning "kalá mátia" ("good eyes"). The best starting point for sight-seeing around Kalamata is the city's historical area where visitors can wander amongst the historic buildings dating back to the 13th century. These include the Castle of Kalamata and the Women's monastery of Saints Constantine and Helen. Just below the historical area is the city center. Aristomenous is the city's main street with a large square and many shops and cafes. Bus 1 makes a stop here too. Below the city center is the coast area which bustles with bathers during the day and young people fill the bars and clubs at night. Navarinou street, to the east of the port, is the "coast" for the locals and the citizens' resort; any time of the day and night you will see groups of people strolling by the sea. Taxis are also offering tours, right across the dock. Plenty of car rental agencies close to the dock. A small tourist office is set up a the dock. 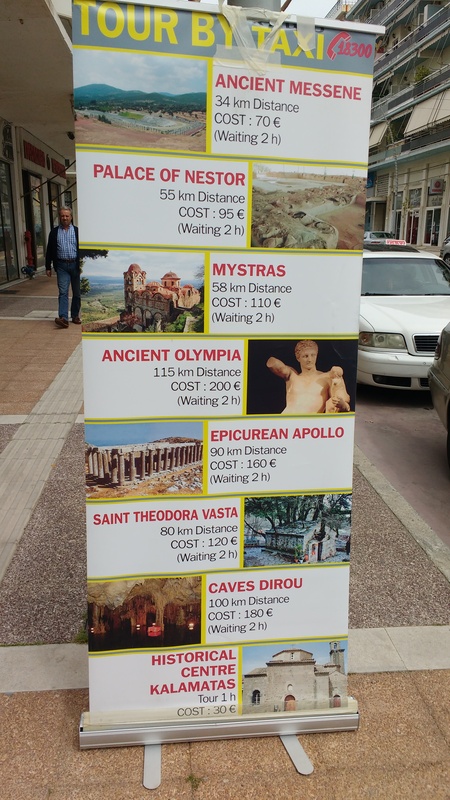 Visit the Ancient Messene. In size, form and preservation, Messene is one of the most important cities of antiquity, and one which still has a great deal to offer. It boasts not only religious and public buildings, but also imposing fortifications, houses and funerary monuments. Opening hours are Monday - Sunday 8:00 - 20:00 between 1 April and 31 October. The sites close as it gets dark during the rest of the year. Best to rent a car to get there. Plenty of nice beaches nearby. The old city is spread out underneath the castle. This is where the Byzantine church of the Virgin Ypapanti and the convent of the Kalograies, where the nuns weave the famous Kalamata silk, are situated. Don't forget to taste at least some of the varieties of honey, and of course the Kalamata Olives for which this town is world famous. The spacious central Vassileos Georgiou (King George) square with many coffee shops, meeting places and strolling venues for residents and visitors. The pedestrian walkway of Aristomenous Street starts here with many stores and coffee shops to populate it. 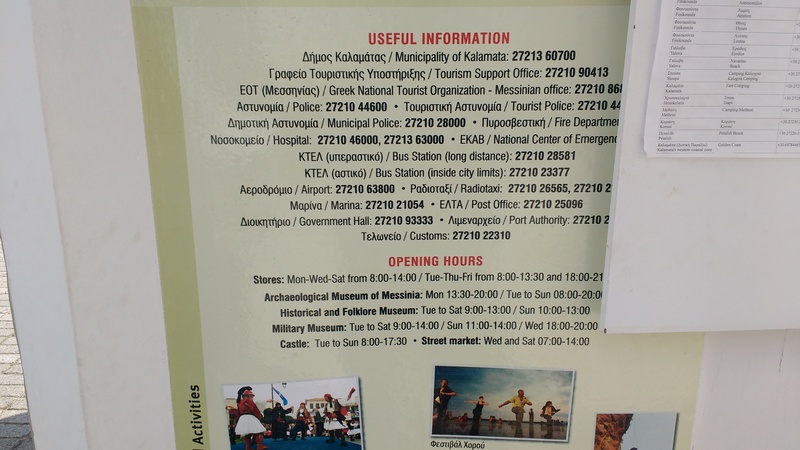 Opening hours for stores and museums.